Showers Pass is a company based on Portland Oregon who makes gear targeted to the cycling audience in the Pacific Northwest. A majority of their offerings are waterproof in nature. The Crosspoint Waterproof Hi-Viz Crew socks are just one model in their lineup of waterproof socks. They also offer low cut and crew socks in a few different models and color schemes. I think that waterproof socks are an interesting idea, but I had some questions. How would they feel? Would my feet overheat and fill the socks with sweat? Could I run in them, and if I did would running in them destroy my feet with blisters? Armed with these questions, I began testing them in late December. I used the Showers Pass website when deciding what size socks for to request from the company. I wear size 9 shoes and based on the Showers Pass website a medium/large sock was my choice since they say it is for men’s 7-10 in US sizes. The mediums arrived and they were very tight, not completely unusable but not comfortable either. I asked the company if they would send me the next larger size which they did and these fit much better, almost too big. I feel like goldilocks trying to find the just right fit. I decided that I like the fit of the larger size the best and that is what I tested. I was not sure how the socks would feel. They definitely don’t feel like normal socks, but they are not rubbery like I was anticipating. They are somewhere in between. The inner fabric is soft to the touch and felt nice against my skin. Showers Pass says that the inner fabric is a moisture wicking Coolmax fabric that is antimicrobial. The outer fabric is also soft to the touch and Showers Pass describes it as a wear resistant knit exterior. I think their descriptions are accurate. I think that they feel like what three layer waterproof jacket might feel if it was beefed up with knit fabrics and shrunk down to sock size. They were very comfortable and I didn’t feel like I needed an inner liner sock. The antimicrobial lining is a nice feature. I have not laundered the socks for the entire time I tested them and they have no smell – none. That is a win because usually I can’t go more than a week without laundering socks due to the smell. 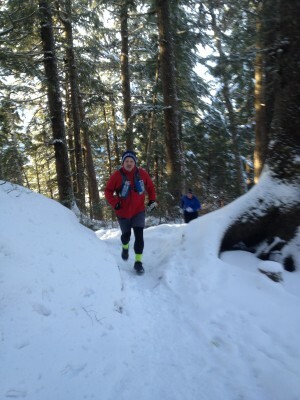 I used the socks trail running, hiking and snowshoeing in the Tongass National Forest in Southeast Alaska. My use featured varied terrain from steep climbs on an icy Mt Roberts trails to powdery snowshoeing trips, to puddle stomping hikes in a downpour that turned our snow into a slushy river at sea level. In all cases I wore non-waterproof footwear to really test out the socks. I am happy to say that the socks are completely waterproof. I did not have a single instance where water penetrated the socks. My footwear would be soaked but not my feet. One particular interesting trip was a multiday snowshoe that required my partners and I to cross some streams. I was able to walk across the streams soaking my boots and the socks but not my feet. I could see water marks on the socks from being in wet boots all day, but nothing penetrated my feet. I was also interested in how my feet would do with the socks in relation to warmth and blisters. I was surprised that the socks were not as warm as I expected them to be. My feet were chilled most of the time hiking in temperatures near freezing while in the snow and rain. They were not uncomfortable, but noticeably chilly. However, while running my feet did not overheat which was unexpected. The socks kept my feet comfortably warm while running in temperatures below freezing. I was also concerned about blisters, especially while running. I am happy to report that I didn’t have a single blister running in them including multiple 10 mile training days that featured a lung busting ascent and hard descent on the icy Mt. Roberts trail to the tram which gains about 1600’ of elevation in a mile and a half. One of my last lingering questions is on durability. How well would they hold up? I am happy to report that after 100 plus miles in the past few weeks there is no damage anywhere. The seams on the socks are still tight, neither the heel nor toe are stretched out. I expect that I can probably get a full season of hard use out of them, maybe even more. I think that they are very well suited for use here in the winter as on any given day it could rain or snow or both. I like having the knowledge that my feet will be dry no matter what footwear I choose for my adventure of the day. I also want to mention the bright yellow color of the socks. They are definitely highly visible. Winter in Alaska means I do a lot of running and hiking in the dark so it is nice that the socks stand out. I would like to see Showers Pass add reflective features to them like they have on some of the other socks that the company offers. Overall, I am very pleased with the socks and happy to add a new piece of gear to my permanent gear pile. I will continue to use them through the winter especially in temperatures at or below freezing. 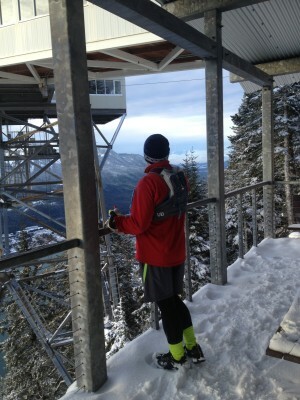 Thanks to Showers Pass and 4alloutdoors for the opportunity to test.